Story: Lightning McQueen, a hotshot rookie race car driven to succeed, discovers that life is about the journey, not the finish line, when he finds himself unexpectedly detoured in the sleepy Route 66 town of Radiator Springs. 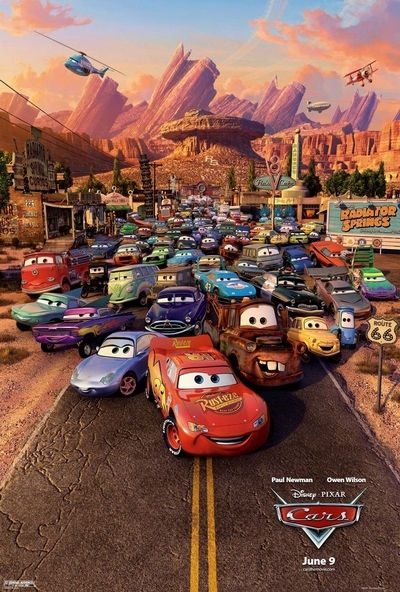 En route across the country to the big Piston Cup Championship in California to compete against two seasoned pros, McQueen gets to know the town's offbeat characters - including Sally (a snazzy 2002 Porsche), Doc Hudson (a 1951 Hudson Hornet with a mysterious past), and Mater (a rusty but trusty tow truck) - who help him realize that there are more important things than trophies, fame and sponsorship. Fueled with plenty of humor, action, heartfelt drama, and amazing new technical feats, "Cars" is a high octane delight for moviegoers of all ages.